A roll of the smallest pins I have ever seen. according to the chart there where 440 pins on each sheet. 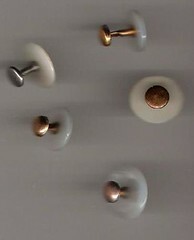 REMOVE BUTTONS QUICKLY BEFORE CLEANING OR PRESSING GARMENT." PIN TO GARMENT IN UPRIGHT POSITION. 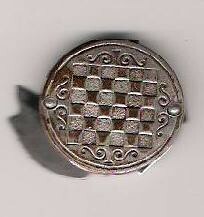 Push pin through under side of fabric - slip on shank button. Close pin in back of fabric as an ordinary safety pin.Its that easy! No twisting,no turning. Pin fits flat to fabric -no bulking. Put this on quickly to make sense of Michael's cuff LINK joke. ~Found in a mixed box of junk on Crewe market. 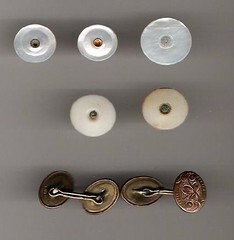 A "rare" collection of various collar studs....(3 mother of pearl and 2 plastic) PLUS a very cheap pair of cuff links with GILT stamped on the back. On some the end tips up for easy use. Some are mother of pearl and some are plastic. 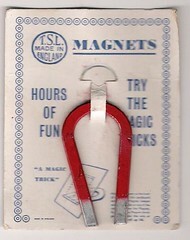 Hold the magnet on the back of a piece of thin card and lay the magnet keeper wire or a needle on the top of the cardboard over the magnet.By moving the magnet slowely you can make the wire or needle roll up hill..."
This is such a simple and elegant way to hold the magnet onto the card. This folding knife and nail file is just bigger than a one pound coin. looks like silver plated brass. The name stamped behind the blade is. There are tiny knotches to open each of the 4 blades...it looks more like a weapon from a James Bond movie than a nail file. Its hard to make out the writing stamped on the back..but its something like..
but I could be wrong!! Another find from the shed..a waistband clip that stretches to allow you to eat big dinners! 3.Press until lug points well through the cloth. 5.Lift the cloth away from lugs so that they are hidden from sight. 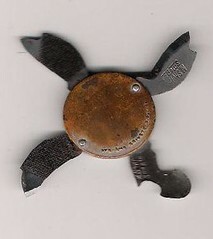 6.Press lugs down firmly with penknife - IT IS IMPORTANT THAT THE LUGS LIE FLAT. 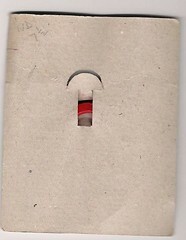 1.Insert clip with hook facing towards open end of waistband. 2.Place fixing plate on outside of lining and insert lugs into the four holes in the clip. When I cleaned out the shed I found some of the early strange metal objects I had collected...I hadn't realised how long this strange hobby had been going on! This packet of curtain rod gliders is very delicate now. SEW TO THE CURTAINS BY THE SMALL EYES.SPACING THE GLIDERS EQUALLY. IF THE HOOKS ARE USED. HOOK INTO THE SMALL EYES. for use with these gliders are sold at all stores in all convenient lengths and at economical prices. Just ask for a "TAUT" rod of the length required. NOTE: "TAUT" curtain rods will extend to about one third of their unexpanded length. Which highlights other exciting products in the range. No.2028 HOT'N KOLD ROLLING PIN. Hollow aluminium barrel with water tight screw ends, for ice cubes or cold water for pastry, or warm for yeast dough.In brilliant carton with recipes. 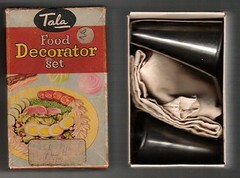 For dainty sandwiches and biscuits.In attractive carton. Sifts 1Ib flour in 20 seconds by easy trigger movement. I own one of these flour sifters and it takes longer than 20 seconds and makes your hand ache...quicker with a sieve!